I saw some bananas sitting on my counter and it inspired me to do some freezer cooking last week. I’ve gotten out of the habit of regular freezer cooking in recent months and oh how I’ve missed it! I’m not even sure why I got out of the habit… I can give a long list of excuses reasons, but I think it just boils down to me not making it a priority. And by not making it a priority, I’ve realized just how much freezer cooking benefits our family and makes life easier. So it’s good to be back into it again. I enjoyed listening to Kat Lee’s Inspired to Action podcast while cooking. I’ve listened through quite a few episodes over the last few weeks and have truly been inspired to action. This bread is so, so yummy and freezes so well! While the banana bread was baking, I pulled out the bacon and started getting it ready to stick in the oven. This was a total experiment idea. We love bacon at our house, but I don’t love the process of making it. 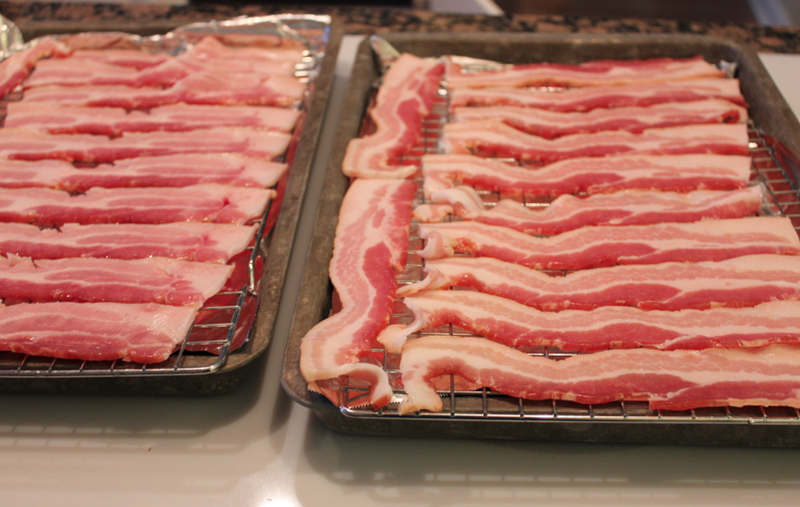 Jesse devised this bacon-cooking plan that works really well — put the strips of bacon on a cooling rack on a foil-lined pan and bake at 425 degrees for 17 to 20 minutes. I wanted to see if I could make a bulk batch and freeze. It froze well, but when I reheated it in the microwave, it was fairly limp instead of crispy. I want to try one more time and bake it until it’s really, really crispy and see if that makes a difference in how it freezes. Has anyone had success in freezing and reheating bacon? 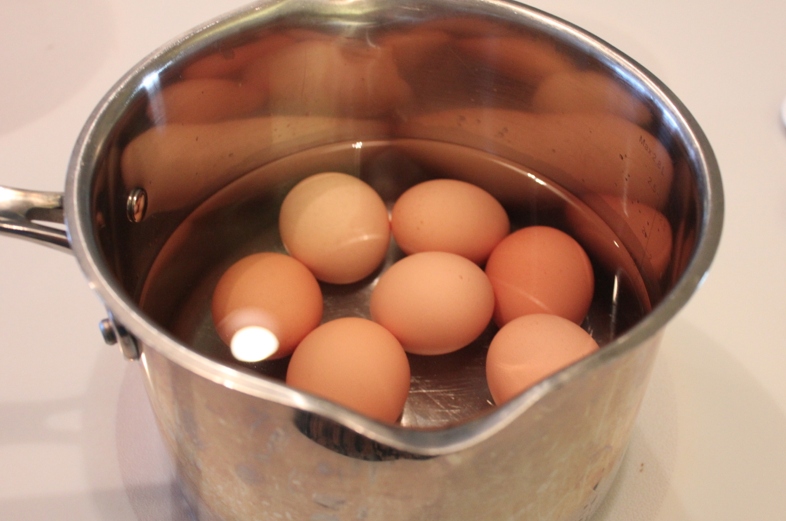 I also boiled a pot of eggs. Not for the freezer, but just to have on hand for quick snacks for our kids. 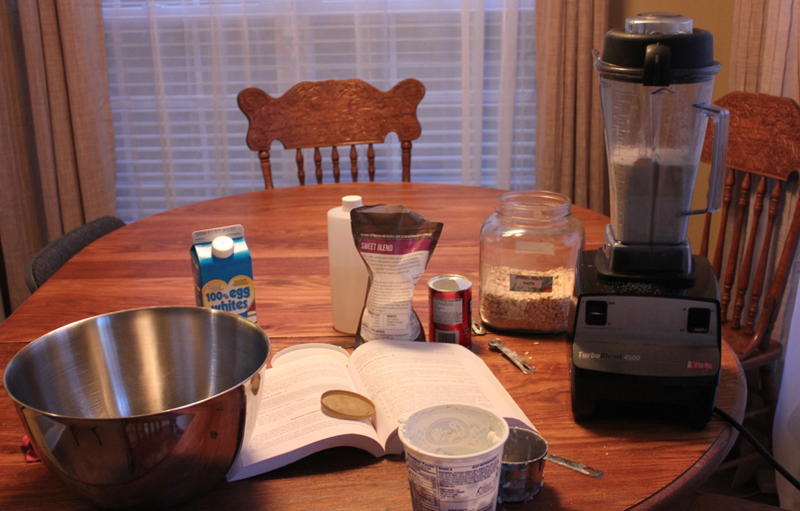 And then I made a batch of Trim Healthy Mama Pancakes. I was excited to try using the new package of Sweet Blend that I recently got. Unfortunately, I didn’t love the pancakes as much as usual with the Sweet Blend instead of Xylitol (that we usually use). I think it’s just because I still can’t get over the taste of Stevia, try as I might. 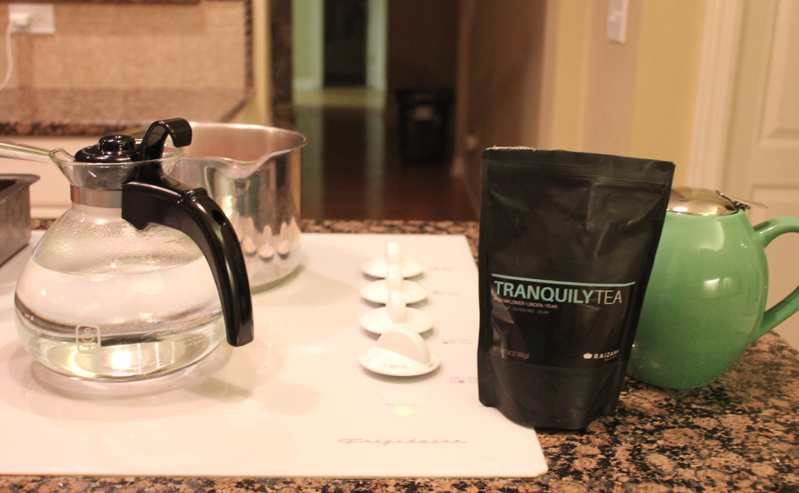 While I was finishing up in the kitchen, I made myself a pot of this Tranquility Tea. It’s so calming and refreshing — perfect to drink with some cream before bed. I cleaned up the kitchen and surveyed the fruits of my efforts. It might seem like just a little bit, but for a small amount of work, I now have some snacks and breakfasts in the freezer at the ready. And little things like that can be such a sanity-saver! Hey Crystal! We freeze and eat bacon all the time! I try to always keep a gallon bag in the freezer for crumbles on baked potatoes, soups and salads, or for pieces in breakfast sandwiches, regular sandwiches etc… Honestly, we probably add bacon to too many dishes! We heat ours in the oven at 400 degrees for about 40 minutes. We like super crispy bacon though. Then let it cool completely and bag it up. We haven’t tried the rack idea, we usually just line the pan with foil and stick it directly on the pan. The pans aren’t fun to clean, but we usually batch cook about 5 pounds of bacon so we only do it about every 2 or 3 months. I just microwave it for 30 seconds. My husband eats it frozen, seriously. On a few things, like salad and potato salad, I’ll crumble from frozen and mix in. it thaws by the time we eat it since its so thin. I love Kat Lee. She has the best podcasts. Didn’t she interview you once upon a time?? The last time I made pancakes, I made them without any kind of sweetener & put natural apple sauce in them. We liked them with peanut butter on them. Next time, I plan to try chopped apples or mashed bananas without sweeteners. I have done bacon in the oven and then reheated in a skillet. Leave it a bit underdone so that it finishes cooking when you reheat it. Yes, you do dirty a skillet but it only makes a little bit of grease and is much easier to deal with then cooking it from scratch. For some reason it doesn’t really seem to get hot in the microwave. Oh, thanks for this great tip! Were you able to save the bacon fat that way? I love to saute veggies in just a teaspoon of bacon fat before putting them in my bone broth soups. Should I admit that I’ve never saved and used bacon fat for anything before?? That’s the truth, I’m ashamed to admit. I think I put too much in. My family ate them no problem at all and Jesse said they tasted different but still good (he’s a HUGE fan of the THM pancakes and asks if I can make them often!) Thanks so much for the tip on using less. I’m going to try that next time. Sometimes I re-heat bacon in a frying pan – it does make it a little crispier than the microwave. Of course that dirties a dish, so I only do that if I’m making eggs to go with the bacon. Heat the bacon first, then use the same pan for eggs! We reheat our bacon in a toaster oven on a plate and it heats up crispy. I think I just use the toast button. If you don’t have a toaster oven, maybe you could put the bacon under your broiler for a few minutes? Try rinsing the bacon in cold water first. Pat dry and then bake. It reduces how much the bacon shrinks. Thanks so much for the suggestion! I’ll have to try that! I’ve sooo missed these posts! I love doing little bits of freezer cooking here and there and am always looking for other ideas and inspiration. You must be feeling more settled. 🙂 Thanks for all you do!! I made banana bread over the weekend and realized in order to make everyone in the family happy I need to make three at a time. 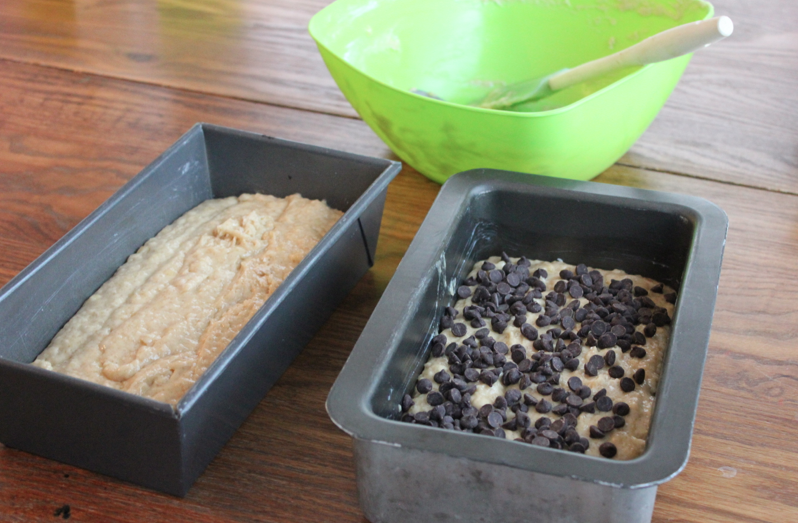 One plain, one with pecans, one with chocolate chips! Why can’t they all like the same thing? We just lay bacon on parchment paper in a cookie sheet to bake and it cooks wonderfully. Then we stick it in toaster oven right on racks and broil for a few when we reheat. 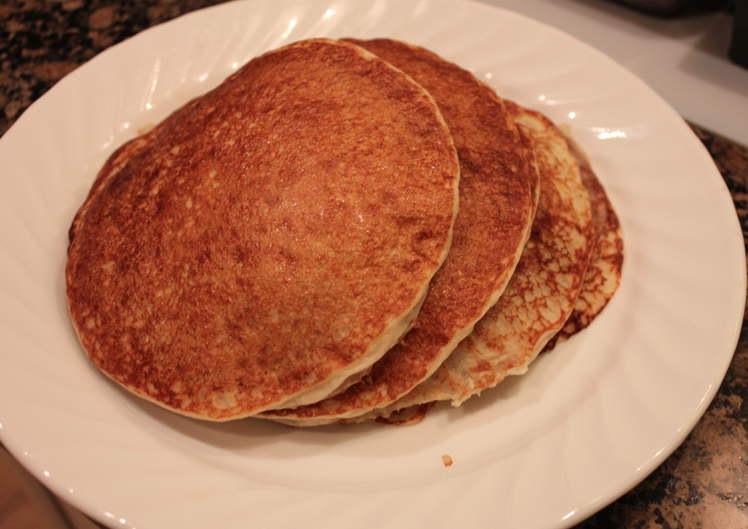 I haven’t got to try the sweet blend yet but we use truvia( erythytol and stevia blend)in our THM pancakes. Its great to have some of these handy! Hi! I’m with you on the stevia thing – tastes like chemicals in my mouth :-(. I use plain applesauce, like another commented. My MIL used to cook to crispy small amounts of bacon in the microwave – but it uses too many paper towels. But I think it would work for reheating. The trick I think would be to use paper towels (or maybe a reg towel you want to wash) underneath AND on top, and keep heating until it crisps up (the water and more fat melt off). I was just thinking of cooking and freezing bacon, so will try this myself (if the bacon is not gone before it gets to the freezer – ha!). Let me know if you figure out the trick to freezing bacon! I am with you on the distaste for stevia..no matter how many times I try it! Just hate the aftertaste. I have been searching for spectacular inspiring freezer baking day on just quick desserts/snacks etc. If you are needing a challenge or inspiration, I would love to see someone compile one! 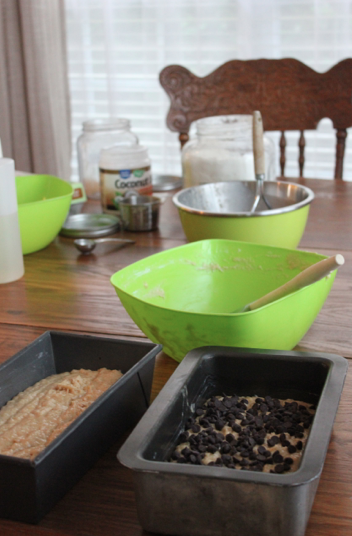 Things like quick coffee cakes or simple cookies that I could pull out and bake quickly for the unexpected guest. But I would love to do one big day of all sorts of recipes and ways to store them etc. If anyone knows of one already on the web..please share the link! thanks! 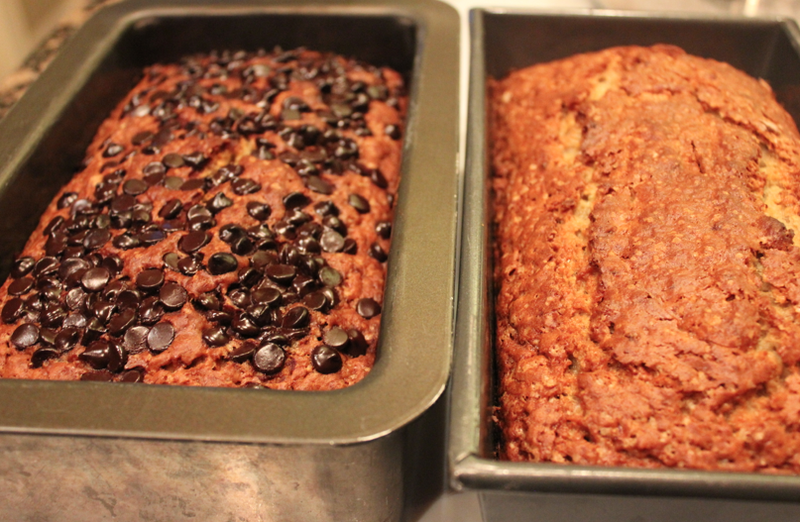 I love making pumpkin bread & zucchini bread. But always hesitate to freeze the entire loaf. 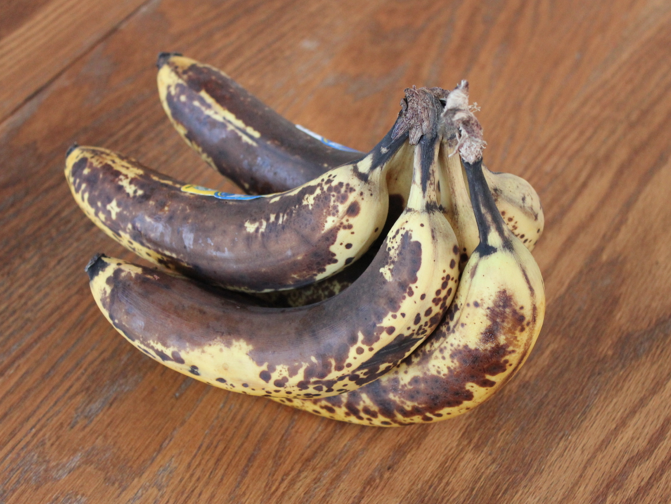 How do you freeze the banana bread? If you click through the link in the post, I share how I freeze it. But the basic idea is to slice it, wrap it in plastic wrap, and then wrap it in foil. Thanks for the info! Would it work the same if I were to freeze the slices individually? Yes, you could definitely freeze individually — I’d probably put them in little baggies or plastic wrap and then in a ziptop freezer bag. I’ve never cared for the taste of stevia or most other sweeteners, except for Splenda, which I learned is not good for you. I purchased the organic Sweet Leaf brand and don’t taste any chemical after-taste. I have a VERY sensitive palate and find metallic/bitter tastes in most things (especially vegetables) so this was a nice surprise for me. I use Sweet Leaf brand of stevia as well & find much better than other brands. I can’t taste any after taste. I use the liquid at home & they have little on the go containers with stevia tablets (like little mints) so I always have that on hand when I’m out & grab a coffee..which is often! ? 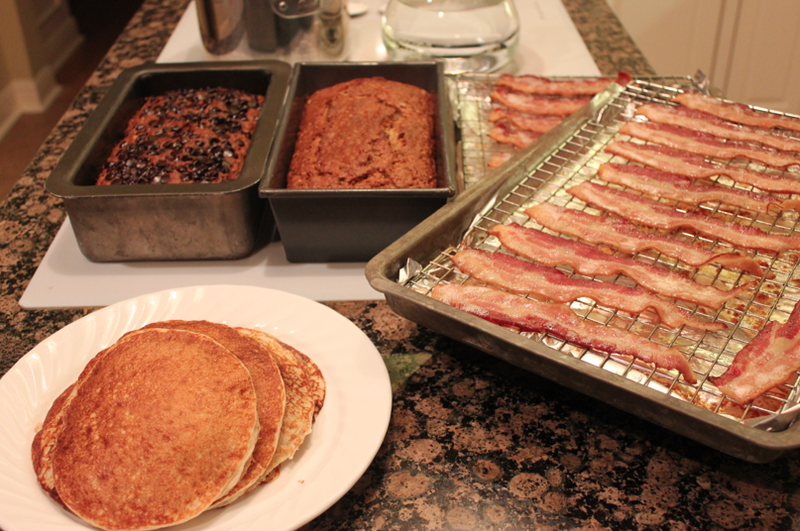 my sister in law cooks bacon in a stoneware baking dish – no rack or foil – turns out great! No idea about re-heating it though. Would a skillet make it crispy again? 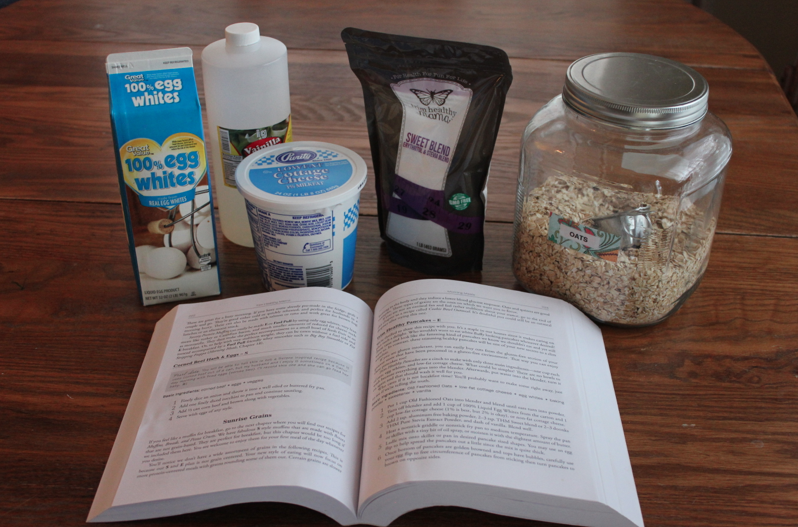 Crystal, I recently started making low carb/grain free pancakes with this simple recipe form Wicked Stuffed. It’s just a few eggs, cream cheese, cinnamon and a tablespoon of coconut flour. 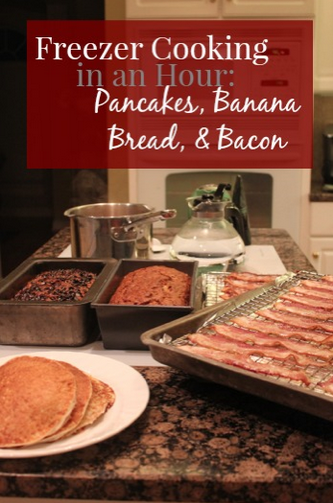 The only take a few minutes to whip up for breakfast. Oh yum!! Thanks so much for sharing! I’ll have to try that recipe! We love Bacon. We love it so much that my son goes to a week of summer camp called Bacon, Brothers and Bibles. My husband is sure that Heaven will have bacon. I reheat bacon by throwing it in a baking dish and heating it at 300 for a few minutes. The secret is to spritz some water on the bacon prior to placing it in the oven. It doesn’t taste reheated at all. I cook up packages of bacon and freeze it all the time. Normally, I cook the bacon in a pan on the stove top. I cook it to the point where it is just a little underdone at the way I like it. I move the bacon to paper towel to cook completely. 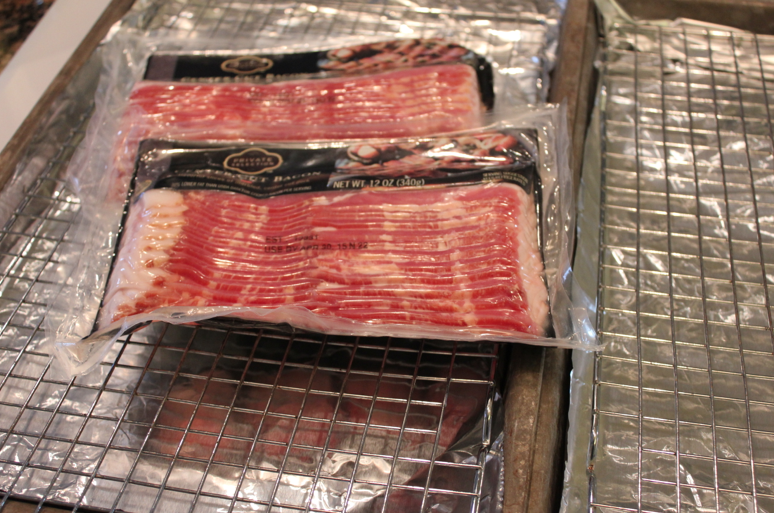 Then I lay out long stripes of either waxed paper or parchment paper and place the bacon stripes separately on the paper, spacing the strips maybe 1-2″ apart; then I roll the bacon up in that paper and place the roll in a plastic bag to freeze. When I want to use it, I pull out the number of strips I want, wrap loosely in paper towel and reheat in the microwave 12-15 seconds. This reheats the bacon and finalizes to cooking to the degree of crispness I like. The time really depends on your microwave power. Adjust the time accordingly to achieve the results you want. I’ve thought about doing the initial cooking of the bacon in the oven but have never tried it. There again, I would cook it to a little under the degree of doneness I like in the final product. Thanks so much for sharing these great tips! Stevia is disgusting. When I was gestational diabetic, I would forgo treats or eat a tiny portion made with real sugar before eating anything made with Stevie. The taste is just weird. I don’t care for the Sweet Blend either. I usually put one tablespoon in the pancakes, and can tolerate that o.k. I won’t be getting any more. I do like the THM stevia, though. If you haven’t cut refined sugar totally out of your diet then that could explain the distaste for stevia. I tried THM 6 months ago and gave up because I didn’t like the Truvia stevia brand. 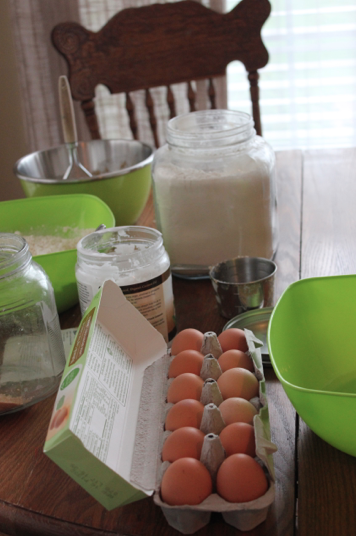 ( I was also sill using honey and regular sugar for baking. Now that I have restarted with THM about a month ago I completely took out sugar and splurged on the the Sweet Blend and it was definitely tastier than other stevia brands I’ve tried. I’m having success now on the plan! It can be quite sweet so a little goes a long way. I’m so glad you are back to freezer cooking! These were my favorite posts and I have missed them! Someone already mentioned this, but we also cook bacon to freeze. We don’t keep it whole- we give it one or two button pushes in the ninja chopper and then keep it in old baby food jars in the freezer. Sometimes it clumps a little but a couple shakes or poke of the end of a spoon breaks it loose. We don’t reheat either, we just add it to whatever dish straight from the freezer. This saves us from buying the bacon bits or bacon pieces from the store (saving $ and no additional preservatives) AND we actually use way less. I love bacon on salads, baked potatoes, and egg sandwiches. 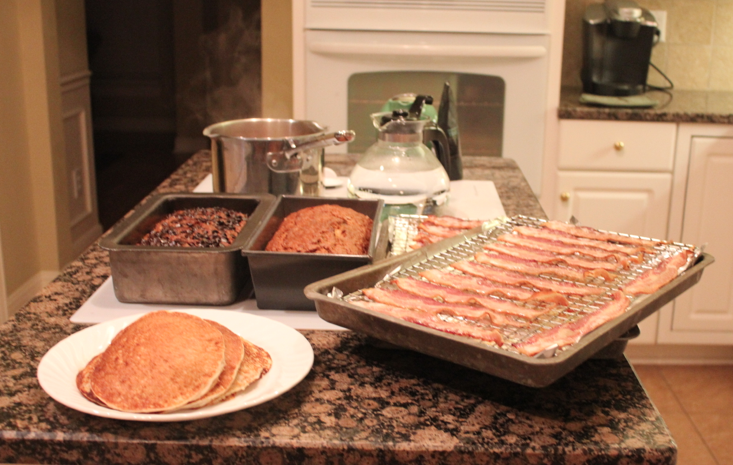 Before we really had to dump on the bacon pieces from the store and they still lacked that really good bacon flavor. Now the real stuff chopped up? Oh YUM, and you only need a couple small pieces to infuse that wonderful bacon taste through the whole dish. Thank you ! You have inspired me to make some freezer items today ! I think it tastes like cake. Yum! i freeze bacon in homemade egg McMuffins! It’s not crisp, but tastes sooo good. I used to use stevia in my coffee ( now I’ve weaned myself to no sweeteners) . The brand makes a difference. I only liked the taste of the organic better now brand. It’s cheap on Amazon. P.S. I love your banana bread!!! Just made some for my freezer cooking session too! I’m totally with you on not enjoying the process of cooking bacon, since it makes such a mess. (I don’t save the fat, either.) But I’ve gleaned a bunch of great tips from reading all of the previous comments – thank you! I use heavy duty foil to line and cover the edges of a large cookie sheet. This way the grease cannot leak onto the pan and clean up is simple…just let the grease cool (and put it into another container if you are saving it) fold up the foil and dispose. Lay bacon on foil. Cover with parchment paper. Place in cold oven. Bake at 400* approximately 45 minutes. We like ours nice and crispy. Drain and cool on paper towels. Freeze. Crisp in microwave till it sizzles. Cool. You will never know it has been in the freezer. 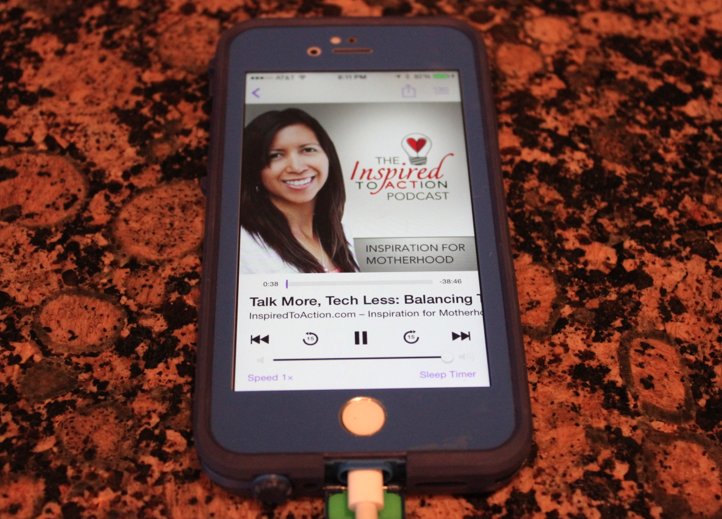 Just download the InspiredToAction podcast and am loving it – even as a newlywed with no kids! Thanks for the recommendation! Freeze bacon? You bet. My husband is a breakfast eater. I leave for work before him so cooking ahead on weekends enables me to give him a hot breakfast everyday. I also cook sausage links and freeze them. When I do my bacon I spray the rack with Pam (really helps with the clean up). Bake in the oven for 15-20 min at 350 till it is a crisp as I want it. I like to sprinkle brown sugar on top and give it a light shake with some Cajun spice. Once the bacon cools I layer the pieces between saran wrap and put in a zip lock bag and into the freezer it goes. Pop it in the microwave for 30-45 seconds and it is ready. I also make pancakes and french toast ahead and freeze it as well.